MOCK exam consists of at 60 questions, that were prepared for YOU by a group of the world class tuition providers and the business experts. They have collaborated together in order to create high quality, relevant and entertaining questions with descriptive answers. It is important that the questions are prepared by a variety of people so in your learning process, you get exposed to the different points of view, different styles of questioning. In this way you become more agile in your thinking and therefore better prepared for the final exam. 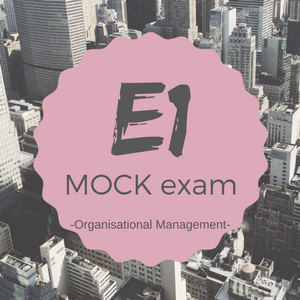 MOCK exam is provided for you in an exam mode, which is limited by time, just like on the real exam. It can be also called an exam simulator. You get the score and the answers after you submit the full test. The questions are based on the chapters from the official CIMA publishing materials. After you submit the exam, you will see your results. You will find there the split per syllabus parts and chapters. Number of questions per each part is set according to E1 syllabus weights. Everything is clear and transparent so you can focus on the areas you need to improve. If afterwards you feel that you should practice more in order to get better results, you can always upgrade to a full package by paying only the remaining amount. You can do that from your account level (My Account button -> My Account Info). Try our free demo with questions covering different levels, including the E1 paper.